5Allenzplus: "Maybe You Can Be Best Friends"
It's Tuesday- Date Night 'round these parts, but since Shayne is running a fever, we stayed in and decided to share putting the boys to bed tonight. Sometimes, we have to divide and conquer. It's survival a sweet thing to do when you're supposed to be on a date. The deal was Mommy would read, then Daddy would sing. If you know us, you know it's a good plan. Mommy definitely shouldn't sing (out loud). After I read every word, I mean every single little word in the Star Wars book, Rex climbed into bed with Isaiah and I climbed into bed with Elijah. Rex began singing "that rock song, Daddy" you know, Rockin in the Treetops and Elijah and Isaiah chimed in at the "tweet, tweet tweets" just perfectly. And while I rubbed his back and kissed his head I started thinking about progress. Just a few weeks ago bedtime was anything but giggly and fun. It was painful. Tearful. Agonizing as if the night cast a spell over him, trapping him in a place where he couldn't sleep until he wrestled with memories of Mommy T.
"this reminds me of Mommy T."
"Mommy and Mommy T. singing together. Maybe you can be best friends. Do you want to be best friends?" I remembered a great resource book I had been given, "Twenty Things Adopted Kids Wish Their Adoptive Parents Knew." Since I actually read this one. Slowly. OK, reading is a stretch, I skimmed it. But I still remembered reading how adopted kids will often fantasize about the relationships between their birth mothers and their mommy's. In case you're unsure, I am MOMMY! So while he did surprise me when Mommy T. came up out of the blue tonight I wasn't offended or threatened by it. I know that his fantasies aren't bad- it's just another way for him to cope. He's healing. No, I don't think we'll be best friends. I know honey. I know. Now, I"m bracing myself for what I thought would come next. Instead, he went right back to the "tweet, tweet, tweeting" and giggling at his brother. In a desperate attempt to calm the monkey jumping in bed with Rex he switched gears and started singing "Lord, I just want to Thank You" and I caught myself tearing up. Elijah didn't know- he was peaceful, snuggled up next to me and dozing off. As I quietly sang along with my husband, my mind took me back. Not just a few weeks, but a few years. When instead of climbing into his bed next to him, I sat in the rocking chair beside his crib and cried, and sang, and prayed. No clue what the days would bring, only knowing I wanted the chance to walk them with these boys. Oh yes, Lord I do want to thank you. For the giggles and the noise. 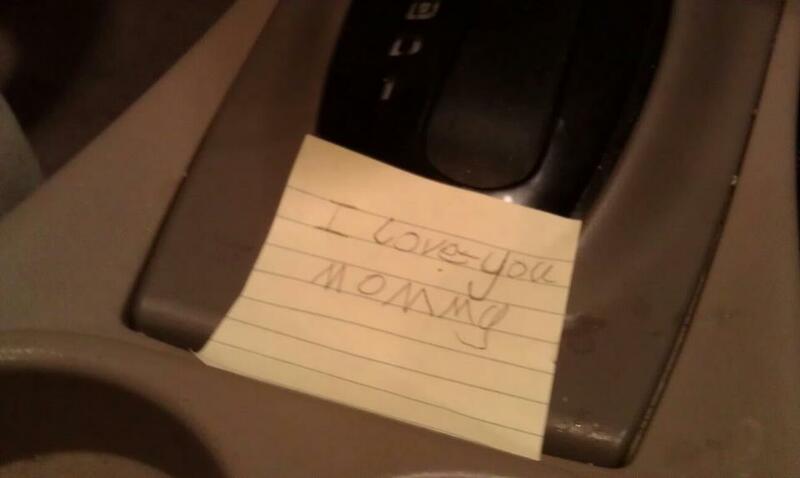 -- in the yellow sticky notes left for me.